The possibilities are endless with the all new 2018 Chevrolet Traverse, redesigned towards a sleeker design and improved interior this mid-size crossover SUV is perfect for you and your family. The 2017 and 2018 Traverse can clearly be distinguished from one another just by looking at the exterior design. The front grille is noticeably bigger with the 2018 design and the hood has a more "boxed" appeal making it less bulky and sharper in appearance. The back of the traverse is more "squared" compared to the old curved back the Traverse had. Overall, the new design is similar to a Tahoe which has a more "truck-like" appearance rather than an SUV appearance. The Traverse receives a whole new make over in the interior, starting from the dashboard the Traverse is now equipped with the simple 8" Chevrolet Mylink touchscreen which offers both Apple Carplay and Android Auto capabilities. A more modern appeal from modernized gauges to high-quality materials for the dashboard, the all new 2018 Traverse is offering a game changer makeover making its way as one of the best mid-size SUV on the market. Chevrolet does a great job of offering safety features in certain packages optional with its trim levels. A new addition to safety is the optional 360 surround vision camera which comes standard with its premier trim levels, the 360 surround vision camera allows a birds eye view, front view and rear vision as you back up. safety features such as rear traffic alert, rear parking assist, blind zone alert and more are optional to the all new 2018 Chevrolet Traverse. 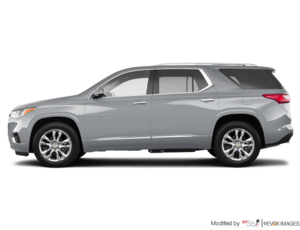 Check out the all new redesigned 2018 Chevrolet Traverse and experience yourself the reasons why Chevrolet is a brand to beat. Visit us at 964 Regent Ave West in Winnipeg, Manitoba only here at Vickar Community Chevrolet "where customers send their friends"